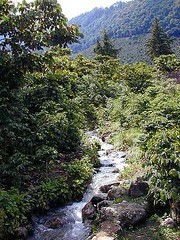 The El Injerto farm in the Huehuetenango region is known for its quality and consistency. El Injerto took 1st place in the 2006 Cup of Excellence, 3rd in 2002, and 6th Place in 2007. This selection has a deep rounded body possessing aromatic bursts of spice nestled in a complex array of semi-sweet chocolate, caramel and fruit. A truly wonderful coffee.